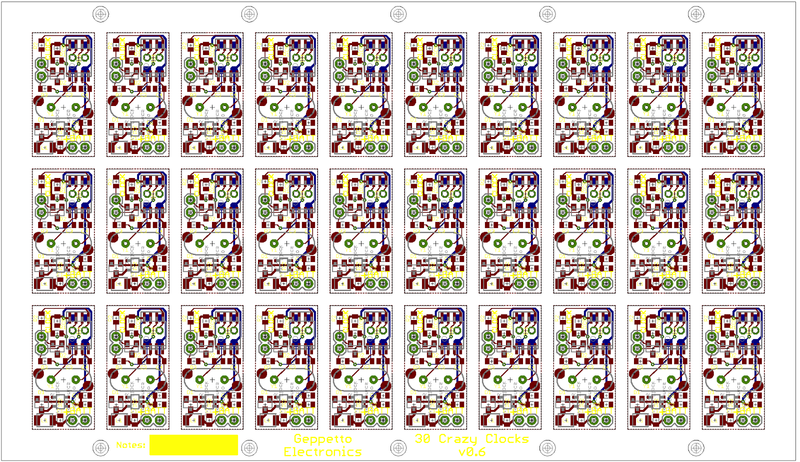 I'm considering making a whole pile of crazy clock retrofit boards. Step 1 of that is panelizing the boards. This is a bit of a tricky operation in Eagle, as it involves breaking the normal synchronizing connection between the schematic and the board. You start by making a copy of just the .brd file for your design. Open the copy and modify it by replacing the box around the outside of the board with a series of disconnected lines, leaving a 100 mil section on each side that's not detached. Next, use the group tool to lasso a box around your entire circuit and use the clone tool to copy it, placing the copies in a grid. Once you're done with that, add another outline to the dimension layer to make a frame around your boards. The purpose for the space between the boards and the frame around the outside is twofold - to add structural integrity to the panel as a whole and to space the boards a bit to aid in pick-n-place operations. You'll notice that there are 10 holes around the edge of the panel. The purpose for those holes takes us to our next manufacturing step. Well, not quite. The crystal for the crazy clock is a through-hole part. Those have to be installed by hand individually. There's no escaping that, unfortunately. If you don't do it yourself, you've got to pay someone else to do it - it's not a step that can be easily automated. The crazy clock is a microcontroller based product. Micro controllers come from the factory blank. Before they can do the work for which they're intended, they must be fused and programmed. The crazy clock board has an ISP footprint on the bottom for this purpose. But the job requires connecting a programmer to it long enough for it to talk to the controller and give it its programming. Since so far the crazy clocks have been programmed to order, but if you're going to get 300 boards picked-and-placed en masse, you're not going to want to break the individual boards out and fuse and program them individually. Instead, you're going to want to make a jig to hit a bunch of them in a single step. At first, I had a mental image of an ISP squid made of a 6 port USB hub, 6 USB AVR programmers, ISP cables and a pogo adapter. There just had to be a better way. And, indeed, there is. This guy has designed a combination of sketch and java code to make a standalone scripted AVR programmer. Hook it up, push the button and wait until the green LED lights up. Lather, rinse, repeat. The only downside is that his reference design is based on an ATMega1284P. Since I'm programming ATTinys, I don't need such a huge chip to do the job. I'm going to adapt his code to use an ATMega328P instead. And this takes us back to those holes. The holes are intended to fit over #4 bolts on the programming jig. Each pair of holes at the top and bottom will be used to align a 6 position programming jig to hit six of the controllers at once. Once the first six are done, you move the jig to the next hole and repeat the operation on those six. And so on. While I'm at the programming, it'd be a really good opportunity to actually test the boards as well. There are two parts of the board that need testing - the boost converter and the controller and clock interface. The natural way to test the power supply is to have it actually power the whole thing while the programming is taking place. An ATMega master and at ATTiny slave during programming shouldn't require more than a few mA - well within the designed capabilities of the converter. And once the programming is finished, the sketch should start running, and pulses should start coming out of the clock terminals. Detecting those are a simple matter of a pair of LEDs mounted in opposed-polarity parallel. Each crazy clock board will individually power its own programmer. The only common connection between the boards will be the BATT connector supplying 1.5 volts to all 6 from a AA battery, and the GO pin coming from a switch mounted on the corner of the board to initiate the programming process. OSH Park sells individual boards by the threes. This is ideal for pogo pin jigs, because you want to use two boards held a fixed distance apart to hold the pogo pins straight and parallel. The top board will be fully populated with all of the LEDs and controllers. The bottom board will get no parts other than the pogo pins coming through from the top. The two boards will be held together with 4 1/2" standoffs and 8 1/4" bolts. Of course, you need to program the ATMega controllers before you can use the jig to program the ATTinys on the panel(s). Each ATMega will need its own ISP. You can't re-use the target connector because it's going to have pogo pins installed in it. Well, that, and the !RESET line isn't actually connected to the !RESET pin of the ATMega, but rather a GPIO pin so that the mega can assert it to force the tiny into the programming state. So you connect a AA battery to the power input of the jig, then press the jig down on the panel and press the button. You should see the programming LEDs go from red to green, and then each of the pairs of test LEDs will start blinking in time with whatever pattern was loaded.